Kat's 9 Lives: How Long Are You Willing to Wait? It was a sign from the heavens that we were not meant to go to Fisherman's Wharf, so Ms. Lin and I decided to try this dumpling place, San Tung, that's highly rated by the internet. We headed over to Sunset and it was a dramatic change in weather from sunny to foggy. There was a long wait to be seated. You can tell this place was popular with the amount of people that wait outside, but is it really worth the wait? The service was so-so as they were extremely busy and trying to move batches of customers in & out. It's your typical Chinese restaurant decor. I was glad that when they sat us down that they didn't make us share the table because you never know what they would do to get more business. After a long wait we sat down and they brought over Spicy Pickled Vegetables that were very similar to Kimchi. I tried a little and it was spicy, I am not a huge fan of spicy. To start off we ordered two types of dumplings. Unfortunately we made the mistake to try the Potstickers. It's 6 wok fried potstickers filled with a tasteful blend of ground pork and Napa cabbage seasoned with fresh ginger & garlic. We also got the Pork Dumplings, which had 12 smaller dumplings steamed. I really disliked the potstickers but the pork dumplings were good. They both have the same filling but how they were prepared makes a drastic difference. I am sure they used the same dough for both, but the manner they used to prepare the potstickers. 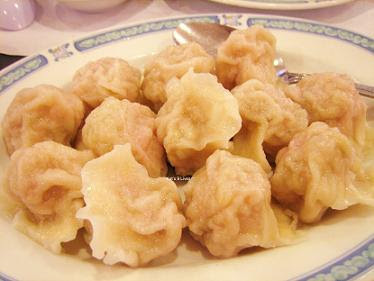 Ms. Lin liked the pork dumplings and asked if she could buy some frozen, but they told her that they only sell it as the price seen on the menu. I thought the filling was flavorful, but my dumplings are better ^_-. All in all I'd reccomend the pork dumplings and definitely NOT the potstickers. Ms. Lin made a funny comment that if you looked around the room only the NON-Asians ordered the potstickers... The internet said their noodles were very good and I asked the server what they recommend. Since there was suppose to be some spicy dishes already, I ordered the sweeter noodles. We got the Noodles with Peanut Sauce made with shrimp, scallops, chopped water chestnuts, mushrooms, onions, & peas with a spicy peanut sauce over their homemade noodles. We were both very disappointed with this dish. When they brought it to our table I was immediately disappointed. It was gravy like and the flavor was lacking. I would NOT recommend this dish, bleh! Ms. Lin worked very hard to finish this dish. For my main course I chose Pork with Hot Peppers and asked that they make it less spicy. 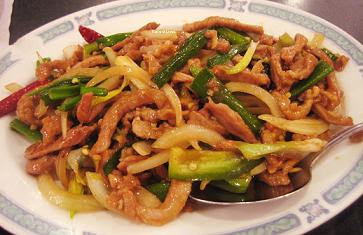 It's shredded pork with jalapenos, onions, and green onions in a spicy garlic sauce. The description of the food was a little deceiving. I liked the dish because it wasn't spicy at all, instead it was peppery. There wasn't a strong garlic taste, which I was kind of disappointed. Ms. Lin would have liked it better if it was spicy. All in all this was one of the better dishes in my opinion probably because I like the mixture of peppers, onions, and a hint of garlic. Ms. Lin wanted their most popular dish the Original Dry Fried Chicken Wings. It's chicken wings deep fried in batter with garlic, ginger, and roasted red peppers. For Ms. Lin, I think this dish was a total disappointment for her. She was really looking forward to it, but it ended not being spicy at all. Instead the dish was very sweet. She still liked the dish, but it definitely was not what she wanted. I thought it was decent, but I didn't like the sugary glaze that really overpowered the dish. The chicken wings were fried to perfection, but I wasn't impressed with the sauce. I would have rather had the chicken wings with a dry rub of salt & pepper with diced jalapenos and red pepper. Now that would be a better dish! All in all I wasn't too impressed with the food. The food was decent and the prices were fair but I don't know if it's really worth the wait. I am not sure why it got so many rave reviews online, to each their own I guess. If I didn't have to wait 40 or so minutes for a table, I would probably give this place another try. Other than that, this was just a decent Chinese place. If you live in SF or near USCF then give this place a try if you're looking for Chinese food because you might like the flavors. Word to the wise, get take out if you live nearby and if you love it then brave the wait to eat there! Totally agree that San Tung is overrated! Its popularity has always been a mystery to me. 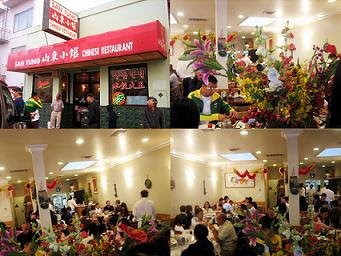 I prefer the noodles at Joy Restaurant (Foster City) - they are excellent! (Just had it recently - we usually just get their dishes). The Noodle Shop (Millbrae, San Mateo) is not bad either. Oh yes, Sushi Sam's is the best! If you're in San Mateo make sure to call me for my beloved SS!